On 22 December 2017 the Solar and Heliospheric Observatory (SOHO) reached 22 years in space. That duration is significant because it is the average length of the complete solar magnetic cycle. sunspot cycles are known to occur over about 11 years, but the full cycle is double this length owing to the behaviour of the magnetic fields. The sun's polarity gradually changes through its cycle, so that after 11 years the orientation of the field will have flipped between the northern and southern hemispheres. At the end of a 22-year cycle, the orientation of the magnetic field is the same as it was at the start. Each image shown here is a snapshot of the sun taken every spring with the Extreme ultraviolet Imaging Telescope on SOHO. Observing in the ultraviolet reveals the sun's corona – the extremely hot atmosphere, up to some 2 million degrees, that extends millions of kilometres into space. 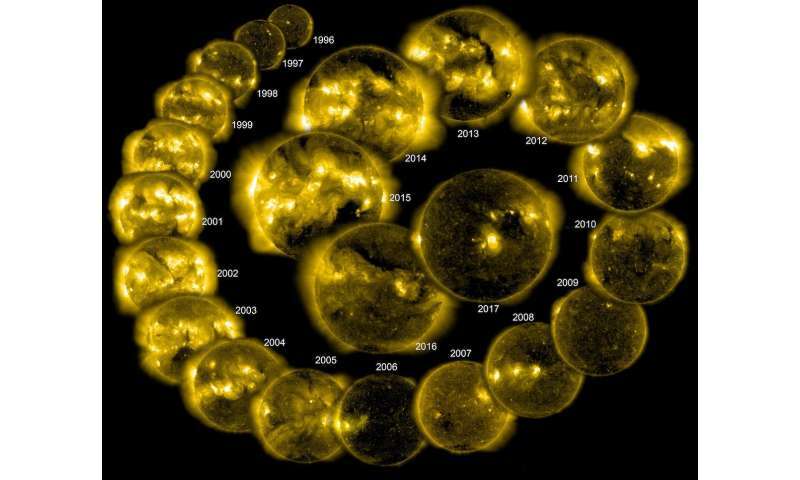 By monitoring the sun for almost a complete 22-year cycle, SOHO has provided a wealth of data on solar variability. This has been vital for monitoring the interaction of the sun's activity with Earth, and improving capabilities in space weather forecasting. SOHO has made many important discoveries with its suite of instruments, such as revealing the existence of sunquakes, detecting waves travelling through the corona and identifying the source of the 'fast' solar wind.